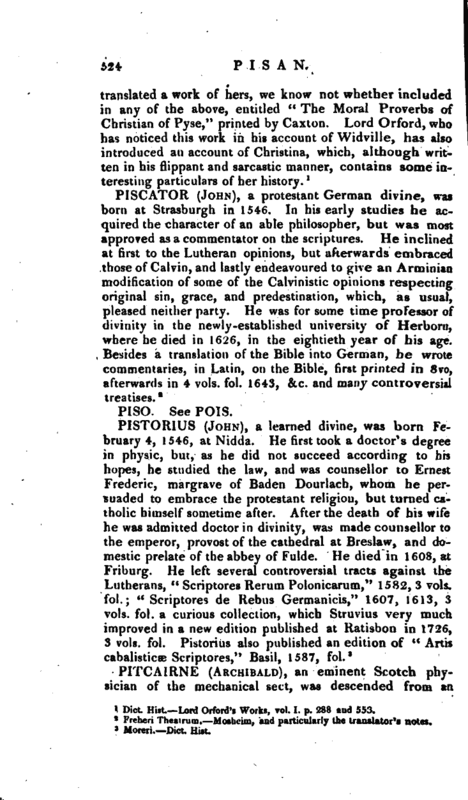 , an eminent Scotch physician of the mechanical sect, was descended from an | ancient family in the county of Fife, and born at Edinburgh Dec. 25, 1652. After some classical education at the school of Dalkeith, he was removed in 1668 to the university of Edinburgh; where, having gone through a course of philosophy, he obtained in 1671 his degree of M. A. and studied first divinity, which does not appear to have been to his taste, and then the civil law, which was more seriously the object of his choice, and he pursued it with so much intenseness as to impair his health. 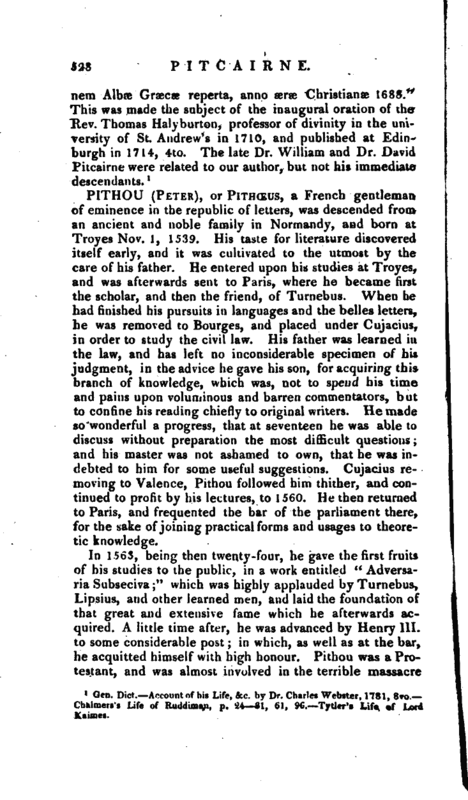 He was then, advised to travel to Montpelier in France, but found himself recovered by the time he reached Paris. He determined to pursue the study of the law in the university there; but there being no able professor of it, and meeting with some of his countrymen, who were students in physic, he went with them to the lectures and hospitals. A few months after, he was called home by his father; and now, having laid in the first elements of all the three professions, he found himself absolutely undetermined which to follow. In the mean time he applied himself to the mathematics, in which he made a very great progress; and an acquaintance which he formed with Dr. David Gregory, the celebrated mathematical professor, probably conduced to cherish his natural aptitude for this study. At length, struck with the charms of mathematical truth which been lately introduced into the philosophy of medicine, and hoping to reduce the healing art to geometrical method, he unalterably determined in favour of medicine as a profession. As there was however at this time no medical school in Edinburgh, no hospital, nor opportunity of improvement but the chamber and the shop, he returned to Paris about 1675, and cultivated the object of his pursuit with diligence and steadiness. Among his various occupations, the study of the ancient physicians seems to have had a principal share. 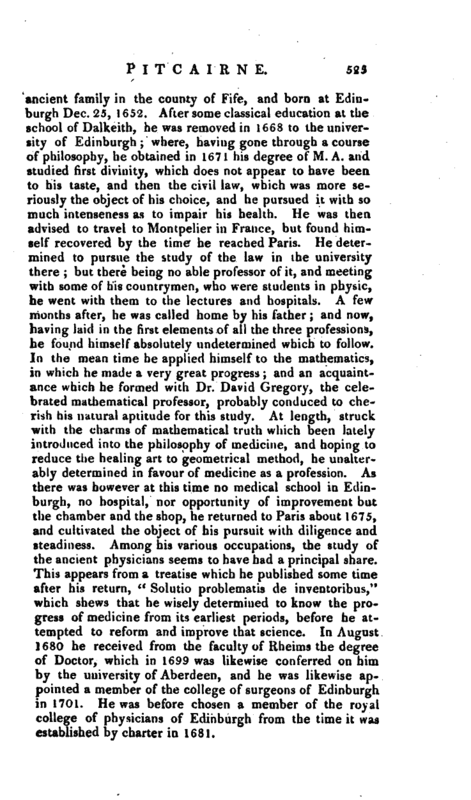 This appears from a treatise which he published some time after his return, “Solutio problematis de inventoribus,” which shews that he wisely determined to know the progress of medicine from its earliest periods, before he attempted to reform and improve that science. In August 1680 he received from the faculty of llheims the degree of Doctor, which in 1699 was likewise conferred on him by the university of Aberdeen, and he was likewise appointed a member of the college of surgeons of Edinburgh in 1701. He was before chosen a member of the royal college of physicians of Edinburgh from the time it was established by charter in 1681. | On his return to Edinburgh, which was about the time of the revolution, he presently came into good business, and acquired an extensive reputation. Such, however, was his attachment to the exiled James II. that he became excluded from public honours and promotion at home, and therefore, Laving in 1692 received an invitation from the curators of the university of Leyden, to be professor of physic there, he accepted it, and went and made his inauguration speech the 26th of April that year, entitled “Oratio qua ostenditur meclicinam ab omni philosophorum secta esse Jiberam.” He continued there little more than a year; during which short space he published several dissertations, chiefly with a view of shewing the usefulness of mathematics to physic. Pitcairne was the first who introduced the mechanic principles into that art, now so generally exploded, but they do not appear to have influenced his practice, which did not differ essentially from the present. He returned to Scotland in 1693, to discharge an engagement to a young lady, who became his second wife, the daughter of sir Archibald Stephenson, an eminent physician in Edinburgh; and, being soon after married to her, was fully resolved to set out again for Holland; but, the lady’s parents being unwilling to part with her, he settled at Edinburgh, and wrote a valedictory letter to the university of Leyden. His lady did not survive her marriage many years; yet she brought him a daughter, who was in 1731 married to the earl of Kelly. In 1701 he republished his “Dissertationes Medicæ,” with some new ones and dedicated them to Bellini, professor at Pisa, in return to the same compliment, which Bellini had made him, when he published his “O’puscula.” They were printed at Rotterdam in one volume 4to, under this title, “Disputationes Medicac,” of which there are eight. The last edition published in his life- time carne out at Edinburgh, a few months before his death, which happened' Oct. 13, 1713. Afterwards were published, in 1717, his lectures to his scholars, under the title of “Klementa Medicine Physico-Mathematica,” although he had taken great pains to prevent the publication of any thing in that way. He even shews some concern about this in his Dissertation “de Circulatione Sanguinis in animaiibns genitis, et non genitis.” There are editions of his whole works at Venice, 1733, and Leyden, 1737, 4to. 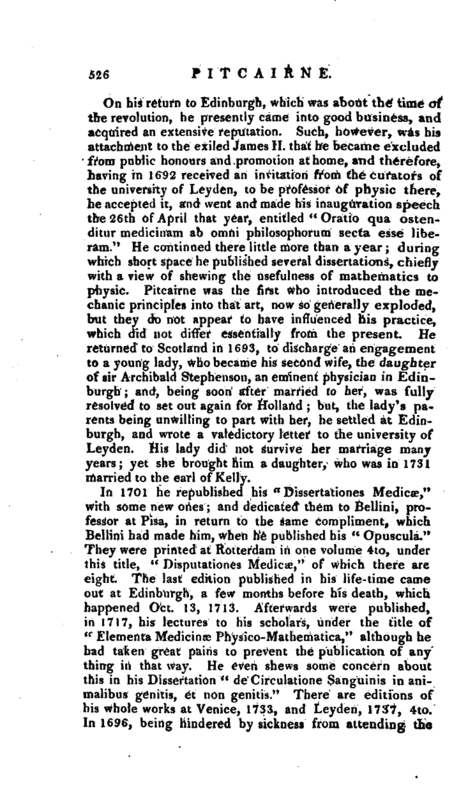 In 169, being hindered by sickness from attending the | calls of his profession, he amused himself with writing remarks upon sir Robert Sibbald’s “Prodromus Historic Tslaturalis Scotiae,” who had published a treatise ridiculing the new method of applying geometry to physic; in return to which Pitcairne wrote, “Dissertatio de Legibus Histories Naturalis,” and published it, but not anonymously, as has been asserted, in the abovementioned year. Pitcairne likewise used to divert himself sometimes with writing Latin verses of considerable merit, which were collected after his death. 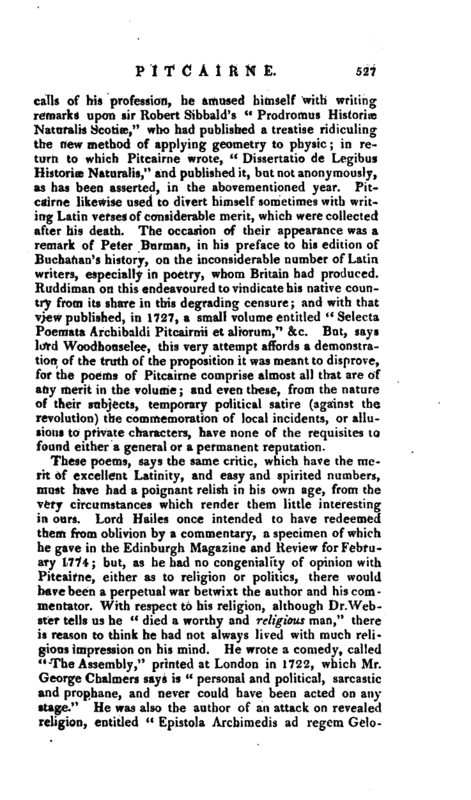 The occasion of their appearance was a remark of Peter Burman, in his preface to his edition of Buchanan’s history, on the inconsiderable number of Latin writers, especially in poetry, whom Britain had produced. Ruddirnan on this endeavoured to vindicate his native country from its share in this degrading censure; and with that view published, in 1727, a small volume entitled “Selecta Poemata Archibaldi Pitcairnii et aliorum,” &c. But, says lord Woodhouselee, this very attempt affords a demonstration of the truth of the proposition it was meant to disprove, for the poems of Pitcairne comprise almost all that are of any merit in the volume; and even these, from the nature of their subjects, temporary political satire (against the revolution) the commemoration of local incidents, or allusions to private characters, have none of the requisites to found either a. general or a permanent reputation.